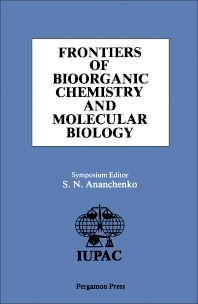 Frontiers of Bioorganic Chemistry and Molecular Biology covers the proceedings of the International Symposium on Frontiers of Bioorganic Chemistry and Molecular Biology, held in Moscow and Tashkent, USSR on September 25-October 2, 1978. This symposium is devoted to a discussion of the physico-chemical basis of life processes. This book contains 56 chapters, and reflects the results in the study of peptides and proteins, nucleic acids, polysaccharides, and other biopolymers. Other chapters deal with the study of low molecular regulators, including steroids, alkaloids, and antibiotics. This book also includes discussion of the achievements in the study of genetic structures and of cellular protein synthesizing systems of the molecular basis of enzymic catalysis and of bioenergetic processes. This book will be of value to biochemists and molecular biologists.